Strong fiber optic light Extending 25,000 LUX to the very spot of treatment, where the light is most needed, assisting the dentist in high precision performances. Silent operation Silent operation (< 60 dB/A) - reducing patient stress, allowing calm working atmosphere. Speed and power With over 12 Watt, 400.000 rpm, high concentricity and well-balanced turbine, performance time can be reduced, for cost effective treatment and to the alleviation of both patient and dentist. Auto-chuck system What a pleasure to simply push a button instead of fiddling with a key! 1-port water spray The standard 1-port spray continues to be effective for pinpoint precision. Ergonomic design User-friendly and most convenient to work with. Low vibration Each turbine is dynamically balanced. Special miniature head This small head makes it even easier to work with children, youngsters and petite- sized adults. Quick-connection 360° swivel and quick-connection provide total freedom of movement! Lightweight Simply delightful to hold a Handpiece weighing only 32 gr. / 1.13 oz. Easy cartridge replacement Simple and fast mechanism allows easy cartridge replacement by any technician according to instructions in Owner's Manual. 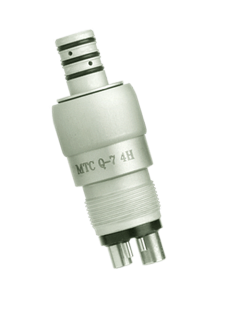 1-Year warranty MTC High Speed Air Turbine Handpieces carry a warranty of 12 months on turbine and handpiece, against defects in materials and workmanship. Midwest Quiet ,Kavo, bein air, nsk, Super Torque, Mti Lynx ,Star, are registered trade names. No implication is made that these products are original factory products or that these companies endorse our products.